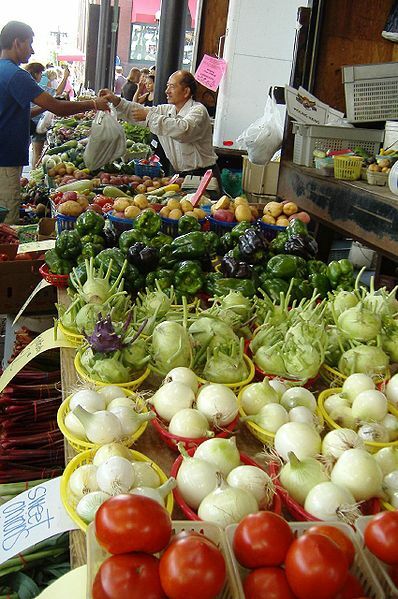 Selling your produce or goods at a farmer’s market is different than selling in other locations or online. Your potential customers have very specific expectations and ideals. Capitalize on those unique characteristics and spend a little bit of extra time to create an image for yourself and your business, and you’ll stand out from the competition. By selling your goods at a farmer’s market, you’re participating in a greater story about community—one that automatically makes your product appealing. For the most part, the people who shop at a farmer’s market have certain ideas about what they’ll find there. 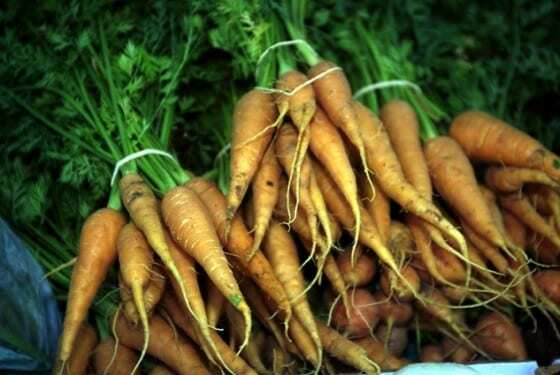 They expect produce or artisan products that are grown or produced locally. They expect to see the owner at the booth. They expect products to be packaged by the owner, in an environmentally friendly way. They want to support local farmers and artisans. They enjoy the community atmosphere of the market. Your business will have a certain amount of potential customers walking “through the door” just based on the community-centric principles mentioned above. Attract and keep customers (and get those customers to refer others) by offering only top-quality products at your booth. Choosing only the best produce to display and sell. The thing about fresh produce is that there can be a big difference between really excellent produce and only so-so stuff. For instance, a perfect cucumber has just the right balance of acidity and sweetness, and is crunchy—not soft or mushy. The customer who buys 6 ears of corn should shuck that corn to find 6 beautiful ears—not four beautiful ears and two that are half worm-eaten. Finding characteristics about your product that is superior to that of other vendors. Is your corn sweeter? Your berries plumper? Your handmade soap made of finer ingredients? Creating interesting packaging that tells a story. Packaging can make the difference between perceived high-quality and average-quality. For instance, bars of homemade soap with a nice wrapper, tied with raffia, look like they’ve had more care than bars of soap just piled in a bin. Take some time to create a booth that is visually pleasing and well-organized and you’ll be ahead of half the crowd automatically. Sure, you can pull your pickup into a space and sell corn out of the truck bed, but you’re not going to create much of a following that way—you’re just another guy with a truck, selling corn. Instead, create a shopping space for your customers. Arrange your product as if you’re Whole Foods. 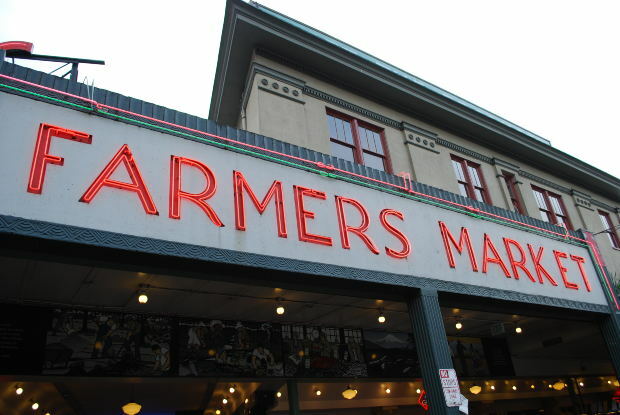 We’ve already mentioned that part of the draw for farmer’s market customers is the experience. They want to feel as if they’re participating in their community and supporting local farmers and artisans. Use some marketing techniques to help them get that feeling while they’re at your booth. Create a cohesive feel for your booth. Choose a name that evokes that local feel: Thompson Family Produce, or Jill’s Handmade Soaps, for instance. Pick colors and a design that play on the local aspect of your product. For instance, if you’re Jill, you don’t want to create glossy, metropolitan packaging and marketing materials. You’re not competing with Nordstrom—you’re the antithesis of large departments stores, which is why your customers will buy from you. Create signage and other marketing pieces that have a specific color scheme and overall theme, so that everything about your booth seems as if it goes together. Think about your local Whole Foods store. Notice how every sign, every display table, every apron on every employee, has the same theme and color scheme? Customers walking through a Whole Foods store never forget for a moment where they are; everything about the store reminds them that they’re encountering a different shopping experience than they would get at the discount grocer down the street. In addition to a large banner hung at the top of your booth, consider creating some signs that can be reused throughout the summer. For instance, small corrugated signs for each item can be designed to match the rest of your marketing components, and will last all year (several years, in fact). And, they look much more professional than handwritten signs on blank paper or torn bits of cardboard. 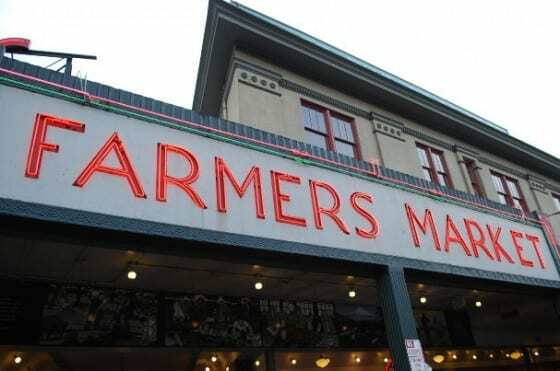 Many of your customers at the farmer’s market want to feel a connection to you and your business—that’s the very reason they’re there! Help them make that connection. One of the best ways to do that is to wear a name tag. When talking to customers, refer to your employees by name. Depending on how busy you are, engage in conversations with your customers. Ask them about their expectations of the product, what they need and how they’ll use it. Share information with them about you and your business. When customers feel as if they’ve made a personal connection with you, they’ll be much more likely to return again and again. Create a website or a blog about your business. Direct customers to your site, where they’ll find tons of photos of your garden, your artisan studio, your dog, etc. A website is a great way to tell that farmer’s market story that people want to connect with. Have business cards handy so people will remember your site when they get home. Once you’ve established that your quality is superior in some way, create some buzz by selling less product. Why would this be a good idea? Well, many farmer’s market vendors steeply discount their goods in the last few hours of the market. Savvy buyers are aware of this practice, so they’ll show up at the end of the day. Of course, by then, your produce has been sitting in the sun for 6 hours and it’s no longer in prime condition. So your buyers might be paying 25 cents for an ear of corn, instead of 50 cents, but they’re getting the picked-over, worn out corn. And you’ve just sacrificed your reputation… while making less money. Instead, calculate how much product you’ll actually sell during the day. Bring that much inventory with you—not an ear of corn or tomato extra. Don’t discount your merchandise—sell it at full price and advertise that once it’s gone, it’s gone. If you’ve done a good job of creating a perception of quality, people will line up to buy your product. They’ll get it while it’s fresh, which guarantees that they’ll be happy with their purchase, and they’ll be back next week. 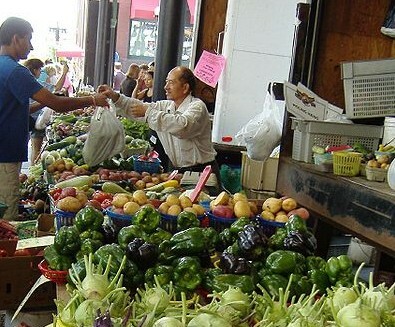 At the farmer’s market, you’re usually competing against other very small businesses, many of whom are relying on that Buy Local mentality to bring in cash. By simply thinking through a basic marketing plan, offering high quality products and going the extra mile to make a personal connection, your booth will easily stand out from the majority.